Symptoms of ulcers can be subtle or outwardly noticeable. A change from being well mannered to suddenly being difficult to handle, girthy, off feed, poor performance in the ring, grinding teeth, to a dull coat and of a general lacklustre demeanor are a good indication of Equine Ulcers. Week 1 - 4: Omeprazole (AbPrazole™) - 2 x sachets, once per day x 28 days. Omeprazole: Gradually reduce to 1 x sachet, once per day. Sucralfate: Reduce to 2 x sachets, once per day. Studies indicate Omeprazole or Sucralfate as a sole treatment is not as effective as a combinatuon of the two, as their modes of action are complimentary. 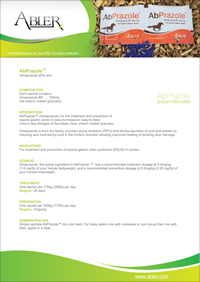 Recommended to administer both Omeprazole and Sucralfate* to treat glandular ulcers. Ongoing: Sucralfate 2 x sachets, two times per day. 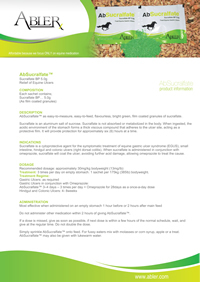 Sucralfate has not been clinically proven to heal colonic ulcers. However, sucralfate is well known as a cytoprotective agent. It binds to GI mucosa, and acts as a "band-aid" to the ulcer crater, offering relief from pain associated with ulcers. Should be administered 30-60 minutes apart from other medication including Omeprazole (and any other medications). First dose of the day is best administered before any other food or other medication is given. The morning is when the horses stomach is likely to be less full. Sprinkled onto a small feed (i.e. a few handfuls of moistened chaff). Mixed with water and administered via oral syringe. Mixed into a paste and smeared onto apples or carrots. If a dose is missed, give as soon as possible, if next dose is within a few hours of the normal schedule, wait, and give at the regular time. Do not double the dose. *Long term use: There is minimal absorption of sucralfate. Side effects from long term use are rare. *Interactions: Sucralfate has been known to bind with other medications, therefore,sucralfate should be administered 30-60 minutes apart from other medication including Omeprazole (and any other medications). Storage: Store in a cool dry atmosphere away from extreme heat. Store/Transport at 20° to 30°C (68° to 86°F). Sprinkle granules onto feed. To achieve maximum effectiveness, best not heated, mixed or immersed in water based food, as granules are enteric coated. For fussy eaters mix with molasses or corn syrup then mix with feed, apple or a treat.